When you fall in love with the brilliant display, easy convenience, and amazing software...don't say we didn't warn you! The SMART Board MX Series Has All the Essentials. The newest interactive flat panel series from SMART has more interactive learning essentials - for less than you think. Elevate outcomes by connecting students, lesson content and devices into one exciting learning environment. 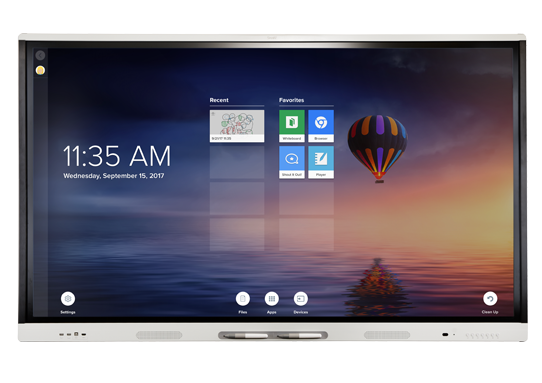 Pick your budget-friendly SMART Board MX interactive flat panel in a size of 65", 75" or 86" - all in 4K Ultra HD. Enjoy a 5-year subscription to the ultimate education software that includes both desktop and online experiences. You'll be covered with a 5-year hardware warranty to give you priceless peace of mind. No need to travel...we'll bring the panel to you! See how the MX series can help elevate your learning outcomes with world-class ease of use, functionality and performance - at a price you can appreciate. And, just in case you thought you knew SMART software, we'll show you that this is not your Grandma's SMART software suite! SMART software frees up teachers’ time for students. With SMART Learning Suite, teachers can create and customize new SMART Notebook® lessons, game-based activities, collaborative workspaces and assessments in just a few minutes. SMART ink lets students and teachers write over videos and websites, and into PDFs, Microsoft Office® files, then save notes into almost any file type. They can also move, copy/paste and erase notes or even convert them to text. Spotlight, magnifier and screen shade tools help keep students focused. Simultaneous Tool Differentiation frees multiple students to write, erase and move notes at the same time. Pens write in different colors, fingers move and palms erase without selecting from a toolbar – so students work together instead of taking turns. The iQ embedded computing includes a web browser and digital whiteboard with screen sharing so students and teachers can share the MX series from anywhere with any device. Access apps from the SMART MX panel's convenient App Library. Thank you! You're request has been completed. A KCAV Team Member will be in touch! I agree that KCAV may contact me with additional information and to schedule an onsite demonstration. I understand that I can withdraw my consent at any time. *Limited quantities. Terms and conditions apply. Offer valid only in the states of KS, MO and NE through June 30, 2019. See the SMART MX in action! Have questions? Call us at (800) 798-5228 and mention MXOFFER.